The time has come for my “The Afrikaner” (Guernica Editions, Toronto) to be officially launched. 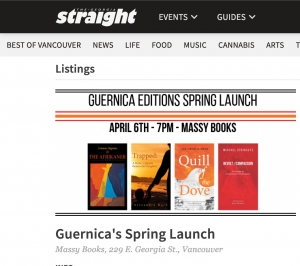 The event will be held in downtown Vancouver at Massy Books (229 E. Georgia Street, Vancouver) on April 6, at 7.00 pm and will be part of a group launch with other three Guernica authors, whose books I find particularly in tune with mine, since they all deal with issues of cultural/ethnic conflict, mediation and reconciliation (see attached flier). Please, mark the date in your calendar and, hopefully, I will see you there! Also, feel free to share this invitation with friends, colleagues and anyone who might be interested. 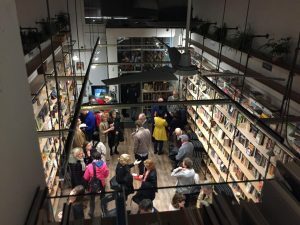 For those interested, there will also be a book signing on March 29 at 6.00 pm at the opening night of the Vancouver South African Film Festival (Simon Fraser University’s Goldcorp Centre for the Arts, 149 West Hastings Street), with part of the proceedings going to the charity Education Without Borders, https://www.educationwithoutborders.ca. 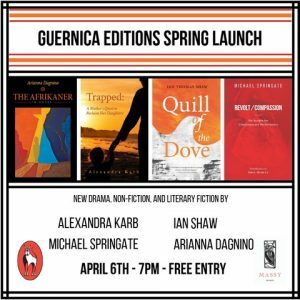 Join Guernica for their first launch of the spring season! Meet with the authors and hear them read from their books of literary fiction, drama, and non-fiction: “The Afrikaner” by Arianna Dagnino, “Quill of the Dove” by Ian Shaw, “Trapped: A Mother’s Quest to Reclaim Her Daughters” by Alexandra Karb, and Revolt/ Compassion by Michael Springate. 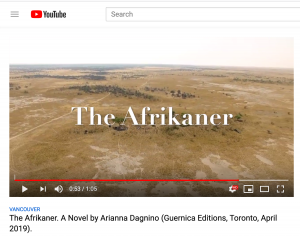 Our son Leonardo (16) made this book trailer to promote “The Afrikaner” online. This is just a preview. What do you think of it? Any feedback/suggestions will be appreciated! 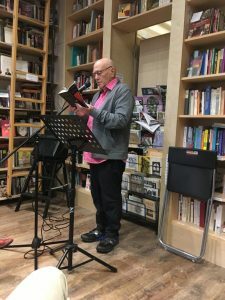 My publisher, Guernica Editions, has organized some exciting book launches in Vancouver (April 6), Montreal (May 2), Ottawa (May 5), and Toronto (May 6): details are on my events page. 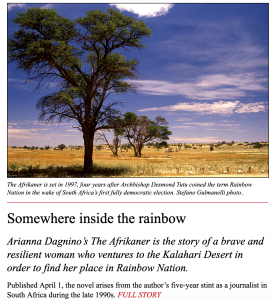 I am particularly looking forward to the first launch of The Afrikaner on April 6 in Vancouver, the town which is now home. 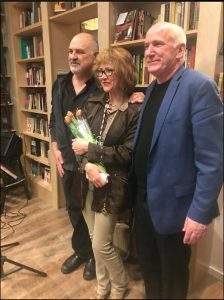 I am honoured to share the launch at Massy Books in Chinatown with three great Guernica authors: Alexandra Karb, Ian Thomas Shaw and Michael Springate. 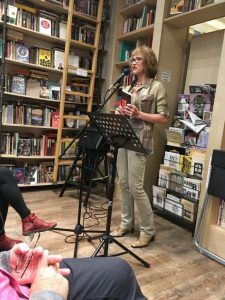 On May 2, The Afrikaner is due to be launched at Paragraphe Bookstore as part of the Blue Metropolis Festival, Canada’s largest bilingual writers festival. I hope to meet new and old friends on the road across Canada! I am proposing here a kind of literary game. 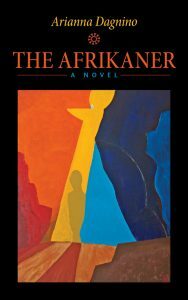 Once you have finished the book, please feel free to provide your feedback and, most importantly, your ideas about an alternative ending or a possible sequel to The Afrikaner. My idea is that a literary work is never set in stone (or paper, for that matter). Out there, in the Quantum Space Of (literary) Creativity (QUSPOC, pronounce: kewspoc), there exist infinite possible versions – and thus endings and sequels – of any given story. Thus, you are welcome to give The Afrikaner an afterlife or a second life through a different ending, or through a whole new sequel. Everyone can participate in this collective game of words and imagination! Just post your ideas and suggestions here (or send me an email: aridag at me doc com) and I will add them to its dedicated page! 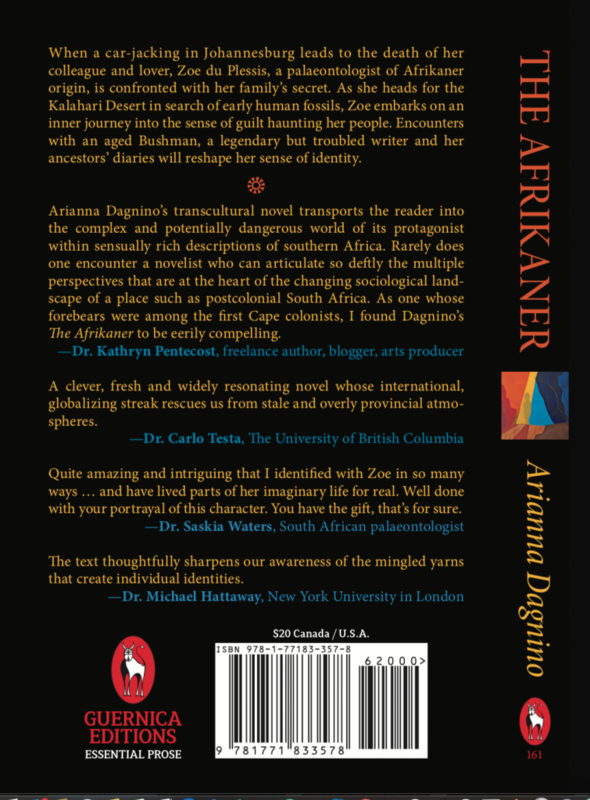 You can pre-order your copy of The Afrikaner from your favourite Chapters, Indigo, Coles, Barnes and Noble, and independent bookstores (find a store through Bookmanager), directly from the publisher’s website, Guernica Editions, or from the following 26 online vendors (click on the icons below for purchase details), including Amazon, Barnes & Noble, and Bokus. Her life is no different from that of many other white-born children of this continent: She invaded Africa, grew in her womb, was raised by her and learned to love her as if she were her real mother, no matter how dysfunctional the womb might turn to be (The Afrikaner). Zoe is a trained fossil hunter who escapes the segregation and violence of Johannesburg for the big sky of the Kalahari Desert. In the hostile desert she searches for the earliest remains of humans in Africa, but she also learns about the ancient knowledge of the local Bushmen. Her brother, Andre, runs the old family winery near Cape Town where she learns about her own Afrikaans family history and its secrets. The realistic discussions about the social and political divisions in South Africa among the White, the Coloured and the Black communities have many parallels with the social conflicts in the US and Canada. What does multiculturalism mean in these different countries? Will Zoe locate evidence of early human ancestors? Will she find answers to her own troubled life? Read the synopsis of the book here. Order now from Guernica Editions, Amazon, Barnes & Noble, Bokus or find a store through Bookmanager.